PORTLAND — Talk about a successful debut. Well, it would hard to have a better debut than Lizzy Stevens enjoyed. 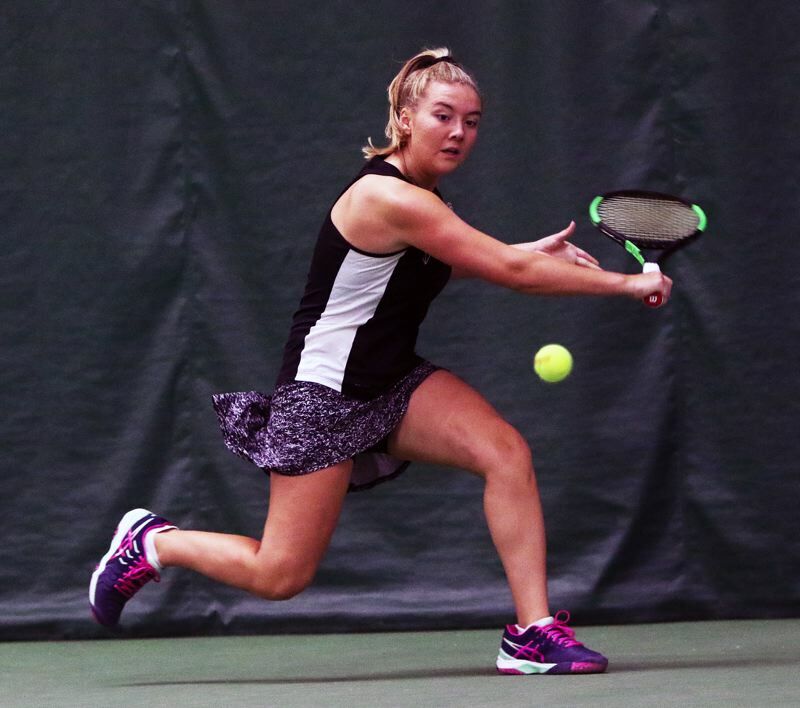 Stevens, a Tigard High School freshman, playing in her first-ever Three Rivers League girls tennis district tournament, turned in a dominating performance in claiming the league's district singles title at the tournament held last Thursday through Saturday at the Portland Tennis Center. "This means a lot to me," Stevens said after scoring a 6-0, 6-2 win over Lakeridge junior Lily Stephens in the district title match on Saturday. "I was representing my school. It's really nice." Stevens will now get to continue her amazing freshman season at the Class 6A state tournament. The top four finishers in boys and girls singles and doubles play at the district tournament advance to play at the Class 6A state event, which starts today (Thursday) and runs through Saturday at the Tualatin Hills Park and Recreation District Tennis Center in Beaverton. "I'm looking to do my best and get to the finals," Stevens said. Stevens enters her first high school state tournament as the No. 2 seed in singles play. She'll get a first-round bye and then play either North Medford senior Krissy Ribeiro or Lake Oswego freshman Bo-Bae Yu in a tourney second round match today, tentatively set to start at 4 p.m.
Sunset sophomore Serim Jin is the No. 1 seed for girls singles play at the state tournament. "I just want to play my game and have fun," Stevens said of the state tournament. "I want to play smart and dictate my play." Well, that certainly worked for Stevens at the Three Rivers League district tournament. She opened the tourney by scoring a 6-0, 6-0 first-round win over Tualatin freshman Sophie Bennett. In the second round, Stevens bested Lake Oswego sophomore Elena Lee 6-0, 6-1. In the quarterfinals, with a state berth on the line, Stevens scored a 6-0, 6-1 victory over West Linn senior Ellen Rowan. Stevens kept rolling in the semifinals, posting a 6-1, 6-0 victory against Lake Oswego freshman Jin Yu. That put Stevens in the finals against Stephens. Stevens got off to a fast start, winning the first two games of the first set. But things got very competitive in a very long third game. Stevens ended up winning that game, getting the winning point in deuce on a forehand passing shot. "That was really important," Stevens said of winning that game, which put her up 3-0. "I didn't want to disrupt my momentum." With her momentum intact, Stevens won the next three games to win the first set 6-0. She also won the first three games of the second set to go up 3-0, before Stephens won her first game of the match. But there wouldn't be much drama, as Stevens went on to claim a 6-0, 6-2 win. "I was a little nervous," Stevens said. "But I calmed down after the first set." Also for the Tigard girls in singles play at the district tournament, sophomore Nicole Mazzeo won her first two matches, beating St. Mary's senior Lily Rogers 6-4, 6-0 and Canby junior Hannah Myers 6-2-6-1 before falling to Stephens in the quarterfinals. In doubles play, the Tigard team of seniors Jaymi McNabb and Juliette Tissuer reached the second round. 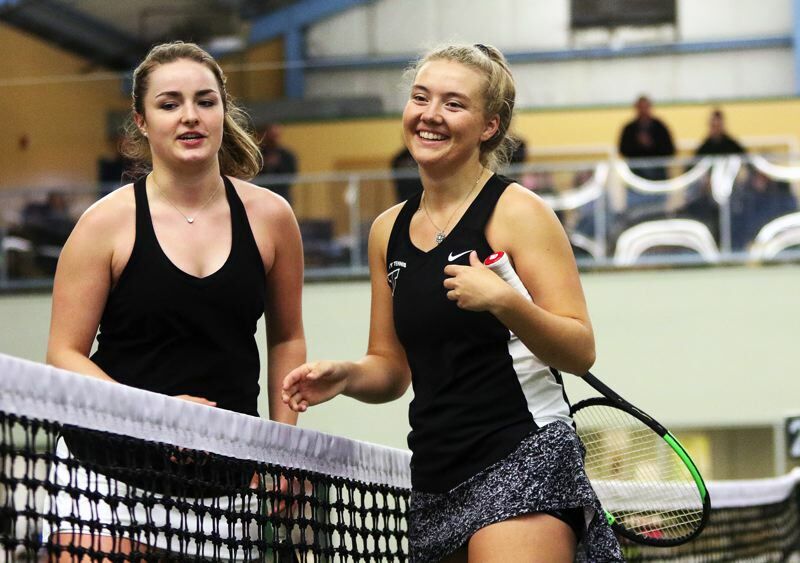 For the Tualatin girls, sophomore Jensen Barnes, trying to reach the state tournament in singles play for the second straight year, opened the tourney with a 6-0, 6-0 win over Newberg's Sarah Dixon. Barnes then bested Sherwood sophomore Rianna Upton 6-3, 6-4 in the second round before losing to Yu in the quarterfinals. Tualatin junior Autumn Lewis reached the second round of the tournament. In doubles play, the Timberwolf team of junior Riley McAdams and senior Sharon Kim reached the quarterfinals. The team of freshmen Elyse Burton and Darci Chamberlin got to the second round. For the Sherwood girls in doubles play, the team of senior Sierra McCauley and junior Josie Rutschman got to the second round. For the Tualatin boys in singles play, junior Will Havnaer won his first two matches to reach the quarterfinals, before he fell to West Linn's Harry Winsper. In doubles play for the Timberwolves, the team of sophomores Jack Rose and Bo Jackson got to the second round. For the Sherwood boys in singles play, senior Merlin Sylvester, senior Connor Albee and senior Josh Duricka each reached the second round. For the Bowmen in doubles play, the team of senior Tony Trov and junior Tyler Anderson and the team of senior J.T. Ruff and junior Jett Krieger each got to the second round. For the Tigard boys in singles play, sophomore Alex Thoren got to the second round. In doubles play, the team of sophomores Evan Riley and Connor Ciula got to the second round. The Lake Oswego girls won the district tourney team title with 43.5 points. Tigard was third with 18, Tualatin tied for fifth with 12 and Sherwood was ninth with 5.5. The West Linn boys won the district tourney team title with 41.5 points. Sherwood was fifth with 11 points, Tigard was sixth with 8 and Tualatin was seventh with 7.5.